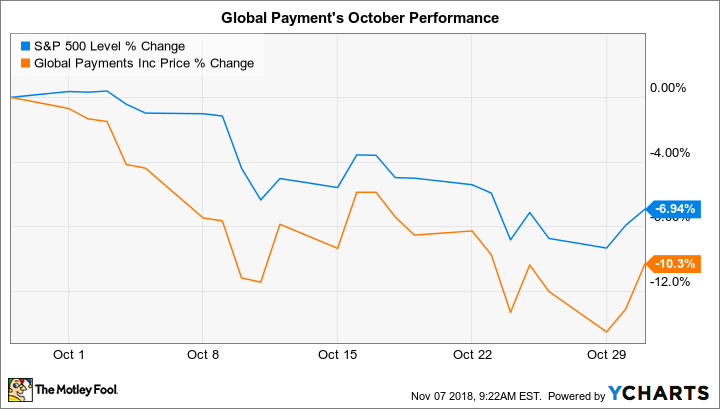 Payment technology specialist Global Payments (NYSE:GPN) trailed the market last month, falling 10% compared to a 7% slump in the S&P 500, according to data provided by S&P Global Market Intelligence. The drop still left shareholders in solid position for the year, with the stock up 12% compared to the broader market's 3% uptick. Global Payments' shares followed the broader market lower through most of the month, and its bigger decline can likely be traced to the fact that it had soared earlier in the year. Investors chose to book gains for many high-flying stocks in October, after all. Its third-quarter report, issued in on Oct. 30, contained no signs of a slowdown for the business. Instead, sales growth was at the top of management's targets and put it in position to beat its broader 2018 goal. Profitability is still expected to expand, CEO Jeff Sloan told investors, by a bit more than 1 percentage point. Given its quick rise, investors shouldn't be surprised to see continued volatility in this stock. Global Payments' long-term trend, on the other hand, will be determined by how well the company executes on its growth strategy, which seeks to pair organic sales gains with acquisitions that build a robust worldwide payments service. Its recent operating results suggest Global Payments is making steady progress toward those goals.